10,000 troops marched through New York City commemorating Washingtons birthday. Josephius Daniels, white supremacist Secretary of the Navy, and labor leader Samuel Gompers address the crowd, 75 members of the International Ladies Garment Workers ignore the holiday and donate their wages to war effort. The Red Sox are tipped to be "in the race," on sports pages almost exclusively devoted to the national pastime. 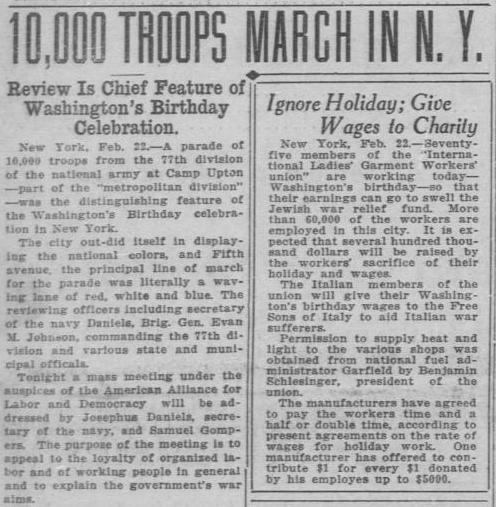 Source: "10,000 Troops March in N.Y.C.," El Paso Herald, El Paso, Texas, February 22, 1918. Page 1, Column 1.